The Thiruvambadi Temple in Thrissur is one of Kerala’s most revered temples. 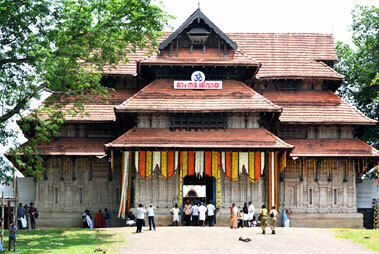 It is one of the must visit sites of the Temple City of Thrissur. The temple is synonymous with the popular yearly celebrations of the Thrissur Pooram festival. In physical dimensions the temple is a small one, but in rites of worship and pilgrims it is at par with the holiest sites of worship in God’s Own country. The main deity at Thiruvambadi is Unnikrishna, Lord Krishna in infant form. Goddess Bhagavathy has a shrine which is worshipped with equal devotion. Lord Ganesha, Dharmasastha are also worshipped in separate shrines. Typically the day at Thiruvambadi Temple starts with the blowing of the conch at 4.00 AM after which sanctums are opened. Enter the temple early to witness the holy oil bath of ‘Vakacharthu’ of Lord Krishna. After decorations, the lord is presented with ‘malarnivedyam’ and ‘venna nivedyam’ after which Seeveli, a unique ceremony is performed. The ‘Thidambu’, a metal replica of the stone idol is carried on an elephant which circumambulates the temple, while ceremonial offerings of rice to Ashtadikpalakas are duly performed. This is the only temple in Thrissur which has a gold-covered flag-mast. It is also the only temple which conducts Seeveli thrice, all time carrying the idol on an elephant. The Thiruvambadi Temple hosts the Thrissur Pooram Festival. The celebration is a climax to the continued round the year activities of divine worship. The festival is aimed at providing an avenue for peace, tranquility and spiritual uplift of visiting devotees. The Thiruvambady Devaswom is known for elephants. The holy temple cares for the gentle beast. They perform rituals and daily and special performances during the festivals. Decorated in colorful garbs and jewelery they service the lord.